Pole Vault exercise helps balance and align the body on the pole while pulling, turning and pushing. This is what the Topper Drill looks like upside down. See how this exercise relates directly to building strength and balance to pole vault higher!! After attending the Elite Coaches Clinic at the United States Olympic Training Center and hearing the strength specialists tell us that pole vaulters should use more elastic strength exercises because that would mimic the elastic energy stored in the bent pole vault pole, I developed The Topper. It only bolstered my opinion after hearing the same thing from the strength experts talk at the Pole Vault Summit. This drill emphasizes the need for balance and alignment of the body and pole while pulling, turning and pushing. This is a great drill for developing strength and balance on the top of the vault. It accentuates the balance between the pole tip and the feet. 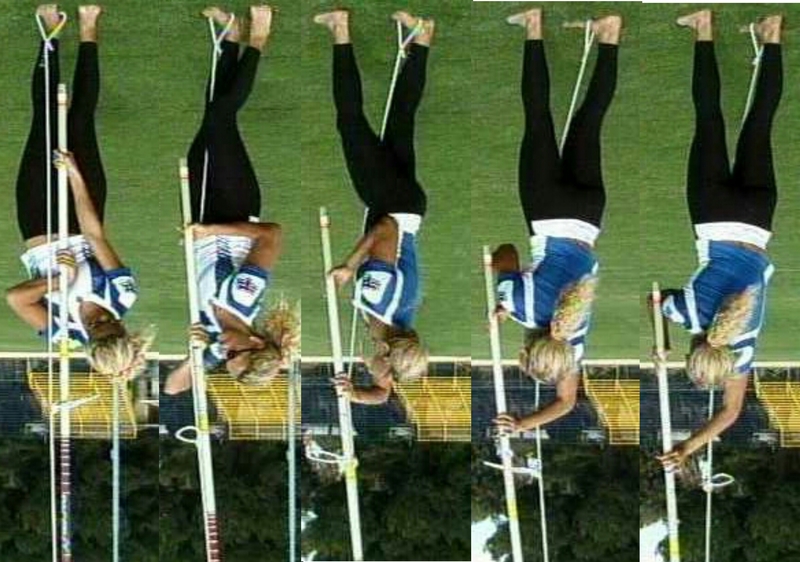 Beginners can start by doing the drill on the ground, while more advanced vaulters can do the drill balancing the pole tip vertically in a clear area in the middle of the field. 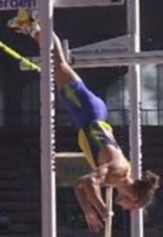 It's best to grip the pole about 3 inches from the end to allow the vaulter to turn and shift the top of the pole above and between the shoulders. The Topper doesn't hang on anything. It attaches to the bottom of your pole and either foot. The stretched bungee shows you the direct line of force between those two points. To be most efficient, your hands and body should turn around that line and stay close to it. When you do your pop up drills you should finish in an extended position next to and in line with your pole. This is the start position of the Topper drill. Even when you vault with bend in the pole, you should wait until your pole almost straightens completely and you should be in an inverted extended body position in line with your pole. (See Lobinger's vault) This is the beginning of the Topper drill. This is where most vaulters fall off the vertical line of thrust coming from the recoiling pole. (See Lanaro) The Topper helps the vaulter feel and develop the balance between the bottom of the pole (or base of support) and the lead foot (or direction of thrust) while building strength to rise directly up the line of the pole. The elastic resistance mimics the recoiling pole giving the vaulter the proper timing coming off the pole. No other pole vault training device does these things. Use it every time you vault. Feel the beginning position of the Topper drill and try to get to that position when you vault. The rest should be the Topper drill.